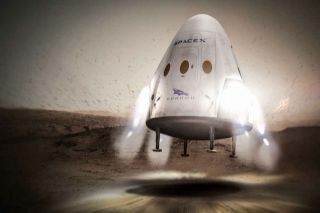 Artist's illustration showing SpaceX's Dragon capsule landing on Mars during an uncrewed "Red Dragon" mission. SAN FRANCISCO — NASA doesn't plan to put any science instruments aboard SpaceX's first Mars mission, which could launch as early as 2018, agency officials said. NASA wants to wait until SpaceX proves it can pull off a soft landing on the Red Planet before committing millions of dollars' worth of equipment to the spaceflight company's "Red Dragon" effort, said Jim Green, head of the agency's Planetary Science Division. The main goal is to practice landing heavy payloads on Mars, to help pave the way for human settlement there — a long-standing priority for Musk. The Red Dragon missions also should have significant scientific returns, since they'll allow researchers to send a variety of gear to the Red Planet, Musk has said. NASA will take advantage of such opportunities, as soon as the first Red Dragon is in the books, Green said. "I can't wait for it to be successful, because it opens up our opportunities to deliver important science instruments into the Mars environment," he said. NASA is providing technical support to the first Red Dragon mission in a number of areas, via an unfunded Space Act Agreement. The space agency will get something out of the deal as well: access to most of the data gathered during Dragon's landing on Mars. The capsule will use "supersonic retropropulsion" to pull off this touchdown. Dragon will slam into the Martian atmosphere going far faster than the speed of sound; to slow down enough to land, it will rely not on parachutes but rather its onboard SuperDraco thrusters.